Water Main Update: Let's hope the band-aid is waterproof. I apologize for the delay getting these details to you. Our church community experienced a major tragedy that has kept Michael and me totally occupied for the past 10 days. But I'm back today to provide some further information regarding the Water Division's plans that I presented in our last post. Once I filled out the mandatory FOIA form the City was quick to provide the documents I requested. The first map I opened displayed the age of the water mains throughout the city; each color represents a different decade of development. This map was not a surprise. The rainbow radiates outward from the river and downtown, with the majority of the recent growth occurring in the northeast quadrant, as the city sprawled out toward I-90. There is a disturbing amount of pink, purple, and dark blue, which indicates mains that are 90-110+ years old (recall that the useful life of a water main is 70 years). For the record, my street is purple. Also unsurprising is the ways the rainbow highlights the shift from traditional, grid-based neighborhoods of pre-WWII development to the cul-de-sacs, curves, and dead ends indicative of the new development patterns of mid-century and beyond. The tight network of mains in pink, purple, blue, and green in contrast with the loose web of yellow, red, and orange is also striking, though just as unsurprising. It was upon opening the second map that the heart palpitations began. Here we see the same network of water mains, with the pipes that have been replaced since 2010 highlighted in red. Take a look back at the rainbow map. Every inch of pink, purple, blue, and light green pipe should have been replaced by this year. Yet in the past five years, this is what has been accomplished. And virtually every bit of red on this map can be explained by a roadwork project (South Main, West State, Bell School Road, Main/Auburn Roundabout, Morgan Street), which is not a problem in and of itself. But the Water Division has made a careful triage system to determine what pipes should be replaced first, and allowing road projects to override that system not only exacerbates the problem of deferred maintenance but proves how roads are driving the development of Rockford. Each of the roadwork projects mentioned above have been influenced or initiated by the State of Illinois, and focus on adding or widening lanes. The language of the soon to begin North Main construction project says outright that it is intended to improve a highway through the city. So where does this leave the traditional, pre-WWII neighborhoods that have the best potential for density not only of housing but business and retail, which form the foundation of our local economy and improve the tax base? Where does this leave the aging, "blight-ridden" neighborhoods where the poorest residents reside? Our city is so focused on dividing the neighborhoods with highways, with making it faster and easier for non-residents to get in and out, quickly, that everyone and everything suffers. Water service is a necessity for a city. But it is only one piece of the puzzle. And what these maps show, with resounding clarity, is that the pieces of the puzzle are steadily falling apart. In addition to these maps, I requested and received the full presentation given by the Water Division. I'll highlight a few slides here. First, the City's own Revenue/Cost Analysis. 1-4 are important but let's skip right to #5: "Current Capital Budget is Insufficient to Ensure Sustainability of Water System." If this was the only slide I could show you, it might seem that if the first step to overcoming a problem is admitting there is one, then the city is on it's way toward recovery! Unfortunately, the Proposed Financial Plan quickly brings us back to reality: not only is the existing plan insufficient, the proposed plan does basically nothing to close the gap. What does an increase in a capital budget of $5M to $10M over 5 years really mean? Today, with $5M in capital we're replacing 1 mile of pipe. Supposedly the extra capital will increase that to 3 or 4 miles of pipe, but of course this is barring increased service calls (which have already increased 30% since 2010) and additional capital projects diverting the water main triage to state-driven road work. The math simply doesn't work. 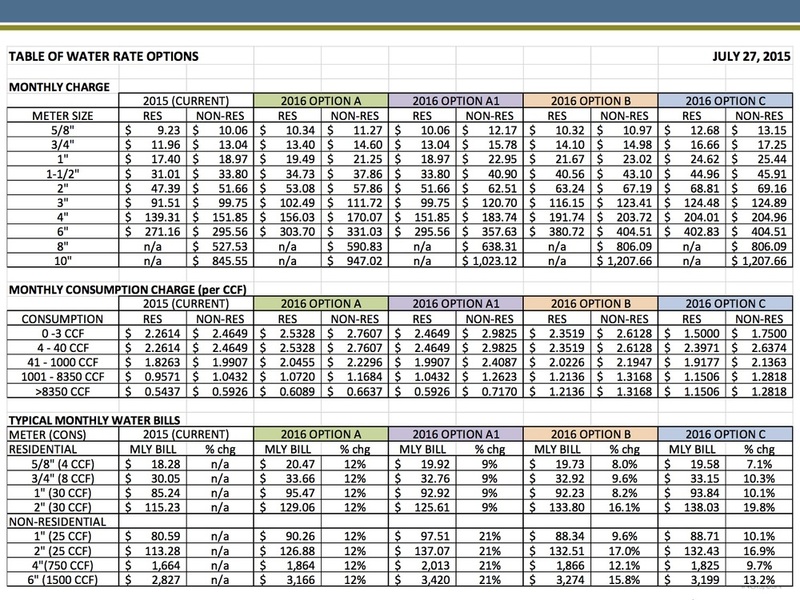 The last 2 slides I've included here are a comparison of Rockford's water rates to other cities, and a chart displaying what the proposed rate increases will do to water bills over the next 5 years. The Water Division is trying very hard to display how affordable our service is, and that it will continue to be affordable even after the increases are added in. In my opinion, this is not in dispute. Our water is very high quality, and it is very cheap . What they have failed to do is show any modicum of evidence that reliable water service will continue into even the near future, nor that the City is prepared to make very hard decisions to bring the water main system back into sustainability. I won't belabor a point that is already clear, that the most basic of city services is on the brink of disaster, Public Works recognizes the reality of that disaster, and yet seems unable to shift their financial structure or development/capital decisions. The proposed rate increases are like a band-aid on a compound fracture. And who will lose first? The neighborhoods that have the best urban layout, the best potential for becoming economic drivers, and the neighborhoods where the residents have the fewest resources (finances, time, connection to power players) to combat these disasters. For many residents in these neighborhoods, the years of investment through property tax, sales tax, and water bills represent the only investments they've been able to make. Their investments in the City of Rockford are their only portfolio. And this Ponzi scheme, as with all such schemes, will mean calamity for those left in its wake. **If you're interested in viewing the full presentation from the Water Division, let me know in the comments below and I will happily provide it. Older PostWe've Done Ponzi Proud.